Get “Virginia’s Health Kick” newsletter delivered to your inbox plus special discount offers when you subscribe today! Dementia is a devastating disease — made worse by the fact that it sneaks up on you slowly. It steals your ability to take care of yourself and wipes out your memories before you’re even aware it’s happening. By the time my friend’s husband was diagnosed with Alzheimer’s, he was already having trouble completing day-to-day tasks and had been forced to take an early retirement. The risk of Alzheimer’s increases as you age. Although dementia has become an epidemic in our country, getting the disease is not inevitable. In fact, we only have to look to the people of Finland for a super easy (and relaxing) way to dramatically lower our dementia risk. 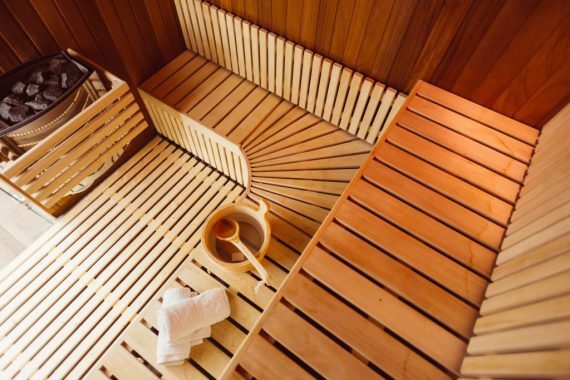 You probably already know that spending time in a sauna is a popular Finnish pastime. But the scientists discovered that this enjoyable way to sweat the toxins from your body came with big perks — the more often you do it, the lower your chances are of ever ending up with dementia and losing your memory. They found that those who sweated it out in a sauna at least four times each week had a 66 percent lower risk of dementia and a 65 percent lower risk of Alzheimer’s than the once-a-weekers. Just by spending 10 minutes or so in a sauna four days a week, you can reduce the risk that you will lose the ability to take care of yourself or remember your loved ones by at least 65 percent. But how does sauna bathing protect your brain from Alzheimer’s and dementia? Well, according to the researchers there’s not really a definitive answer but they think it’s probably a threefold mechanism. First, it allows your body to sweat out toxins that could be damaging to your brain and nervous system. Second, it boosts your heart health which has been shown to help your brain function better as well. And third, the sense of well-being and relaxation you get when you just chill out (or sweat it out) in a sauna may also play a role. • Exercising — Exercise makes every part of your body healthy, including your brain so get out there and move. Your goal should be at least 30 minutes per day three to five days a week. • Supplementing — The most important supplement for brain health is phosphatidylserine (pronounced “foss-fah-tie-doll-sir-een”). This nutrient is the key building block for billions of cells in your brain and acts like brain food. In fact, 64 studies have proven that it is one of the single best nutrients for rejuvenating your mind and memory. • Improving your sleep — Quality sleep gives your brain time to rest and repair while impaired sleep can increase your risk of Alzheimer’s. Shoot for at least eight hours per night and establish a regular sleep schedule. • Staying connected — Loneliness can lead to depression and poor cognitive function. Maintain healthy social relationships to boost your brain health. Dementia rates may be increasing but your risk doesn’t have to. Hit the sauna at least four days a week, exercise, get rest, stay social and feed your brain with phosphatidylserine to optimize your brain function and your memory. Always FREE shipping on 3 or more bottles! Can hot tea melt away obesity, diabetes and heart disease? Did the latest research crack the code on cholesterol and eggs? Before you take any supplement, please consult with your physician or other licensed healthcare professional to determine if a supplement is appropriate for you.